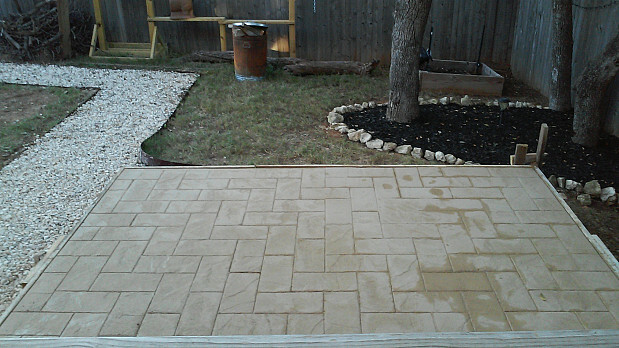 WHAT MY NETWORX CONTRACTOR DID FOR ME: Installed and stamped a concrete patio. WHY I CHOSE HER: Availability, fair price. My son wanted to put in a patio made of pavers, but his yard has such a slope that he would have had to build a retaining wall to make it level. As a more practical alternative, I suggested poured concrete. 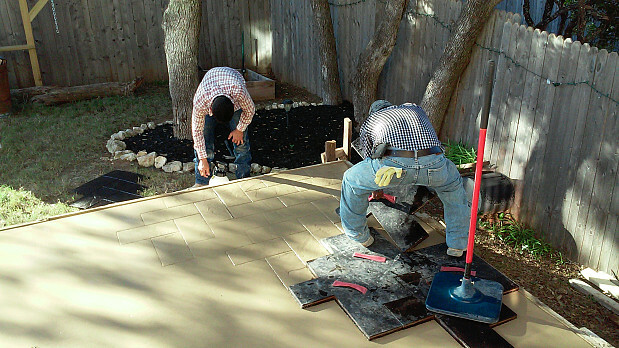 Because he didn’t want just a flat slab, I told him, “Well, they have stamped concrete. You know what that is?” He wasn’t familiar with it, but when I showed him some pictures on the internet, he liked the idea. I told him I would look for some contractors in his area online, so I googled “stamped concrete in San Antonio, Texas.” A link to Networx came up. After I filled out some information about the project, Networx let me know that contractors in my area would be contacting me soon. Laura from LVG Construction called me and came to my son’s home that afternoon with a helper to take some measurements and give me a bid. I didn’t get many quotes, but they were all in the same ballpark. Laura actually adjusted her bid downward when I said it was a little too much. I was glad that she and her crew were in between jobs and could start work right away, since I was only in town for a few days (I live in Tucson) and I wanted to see how the patio would turn out. Laura gave us a choice of concrete colors and patterns; she brought tile pattern samples and also a color palette, just like somebody painting your house. We decided on beige, which she recommended to go with the color of the siding. It was a labor-intensive project because they had to wheelbarrow all the fill and the concrete into the backyard. She had said it would be a $1000 just to rent a pumper truck (a concrete truck with a boom, to go over the fence), which would have been reflected in the price. Laura owns the company, which is a family business. Her father was the one putting up the formwork and the other workers were cousins. They started on a Thursday – did the prep and formed it all up, and came with the reinforcing for the slab and the stem wall. I’m a structural engineer who’s seen plenty of slabs poured. I saw they reinforced the slab and the stem wall correctly so if the patio cracks at all, it will be along the pattern. On Friday they placed the concrete, let it set up for a few hours, and then came with the stamps. Concrete stamps are rubber patterns, which they spray with release solution and then pound. You can see them in the first picture. The second picture shows the semi-finished results. They came back after that photo was taken to finish the patio with a sort of glaze, but I wasn’t at my son’s place for that part. This is a fairly new thing that they do with concrete, to dress it up. It’s much less costly than brick pavers and of course it won’t move around with time or have joints where weeds could grow. It was a bonus to get the project done so quickly; from when I first contacted her to the time the patio was completed was less than a week. My son and I were both really happy about the way it turned out. The patio looks good, even better than in the pictures. If the contractor is slow in responding, don’t waste your time. If they miss an appointment to come for a bid without contacting you, just don’t bother with them. They’re not hungry. Get 3 bids, to satisfy yourself that you’re getting a good price. If the prices are all close, it’s probably a legitimate price. If you get one that’s outrageously high, they don’t really want to do the job; they’re trying to discourage you. On the other hand, if they bid too low, the quality might not be as good. Get a feel for the person you’re dealing with. If the guy shows up on time, that’s a good sign. If they continue to reschedule or put you off for some reason, don’t pursue them any further. Read the reviews. The internet makes it easy to find out what other customers’ experiences were like. We Finally Extended our Concrete Patio and our Yard Looks Amazing by Binoy P.
Hot Water Heater Replacement by a Family of Experts by Glenn G.